'Tis the season ... ? Guess who we went to see last week? Megan was ready to go as soon as it was our turn. She asked Santa for a drum set. Finally, Sean warmed up to the idea of sitting on Santa's lap. (Props to Santa, by the way, for fitting 3 kids on his lap!!) He asked Santa for a "bobot" (a hot word around here since Halloween). When Santa asked what kind of robot, Sean's simple reply was "blue". I guess I could sound really old and say that Christmas comes earlier and earlier every year, but instead I'll choose to embrace the excitement and spirit of the Christmas season. It's been in the 20's and 30's here in NC, so why not?? It sure is beginning to look a lot like Christmas! It's been (and still is!) a very busy swap month. I've received word that another of my creations has reached its destination. Remember the 1974 quilt I shared a few weeks back? 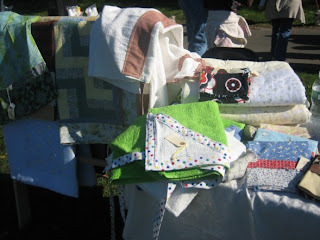 It's now in chilly New England with The Vermont Quilter (aka Dorothy). Made from a charm pack of "1974" by Urban Chiks for Moda. I used Amanda Jean's Hourglass Tutorial and I love how it turned out ... although, as she warned in the tute, I had some issues with bulky seams. Isn't the backing fabric the best? I purposely tried to center the little bird so that he didn't get lost in a seam! To label this quilt, I used the design of the fabric to find a little spot to sign with my new Micron pigma pen. I'm still not sure how I feel about using a marker to write on my quilt -- it made me VERY uncomfortable and VERY nervous! 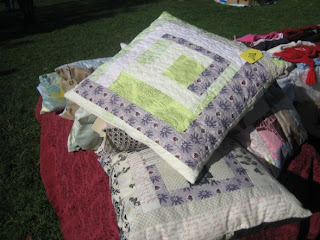 -- but I think it was the best solution for this quilt. 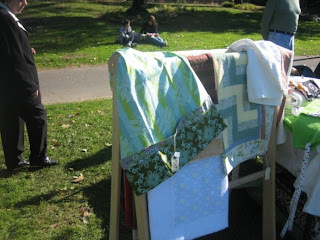 Oh, I forgot to mention that this was part of Kate's Another Little Quilt Swap (round 2). I hope you enjoy this little quilt, Dorothy ... it was really hard letting this one go!! The Craftster Lap Quilt Swap 5 is now full, and we're all busy gathering and sending our fabrics to our new group members. I wanted to share a few photos of the fabrics I've selected for this round. It started with a FQ bundle (and 2 matching charm square packs) that I got on super clearance. It's a line of fabric called "Kumo" by Sentimental Studions for Moda (the best pictures I could find online are here). The line is Asian-inspired, which isn't usually my thing but there was something about the colors that I really liked. I got it about mid-way through the last swap with the intention of using it for round 5 but, over the last few months, I'd grown lukewarm about the selection. I started to consider using different fabrics for this round of the swap, but the guilt of having all of that fabric and not using it was nagging at me ... so I stuck with it. I wanted to get a matching solid to stick in with all of the packets and wound up selecting a couple of different neutrals (khakis and greys), some coordinating small-scale prints, and even a homespun fabric that I thought matched the line really well. Suddenly, I started getting excited about the fabrics again. It's pretty amazing to see how the additions really enhance the fabrics and, susequently, elevate my feelings about them! I'm really excited to see what everyone comes up with. 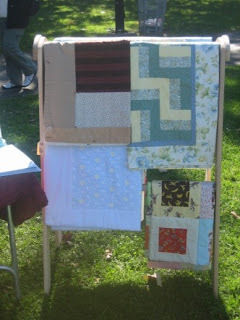 If the blocks I got in the last swap are any indication, I'll have another beautiful quilt on my hands! I've received word that my little quilt for The Quilting Pirate's Holiday Booty Swap has reached its new home, so it's safe to share some pictures. I made this little quilt from a charm pack of "Peace on Earth" by 3 Sisters for Moda. My swap partner, Cheryl, indicated that she likes traditional Christmas colors and patterns and I thought that this selection fit the bill just perfectly. 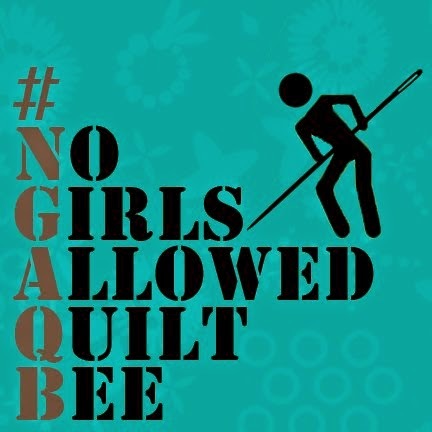 I took this opportunity to audition a block pattern for a larger quilt that I am also currently working on. 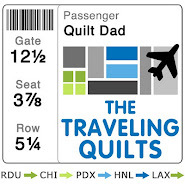 It's from the Fall '08 Easy Quilts magazine. It's very easy to cut and piece and I love the look of the simple blocks. The quilt's about 24" x 24" or so. I've been trying to find a labeling method that I like. I love designing labels that can be printed on my computer, but I haven't mastered hand-stitching it on the back yet. Plus, I went through an entire 5-sheet pack of $12 printer fabric that all had to go in the trash because of printer issues. So this time, I tried simply taking a 5.5" square of white fabric, ironing it in half, lining up the raw edges with the corner of the quilt and stitching it under my binding. I then used a Micron pigma pen to write out the deets. I'm pretty happy with this method, though I'm not too proud of my handwriting! 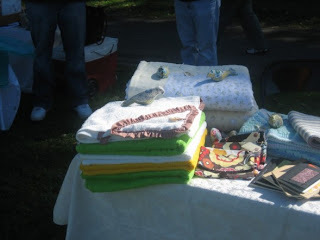 Craftster Swap | Come join us! 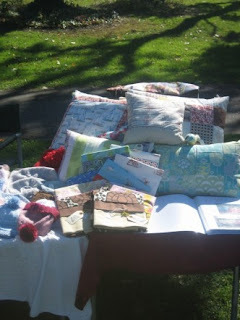 We have 8 spots left in our Lap Quilt Swap over at Craftster. 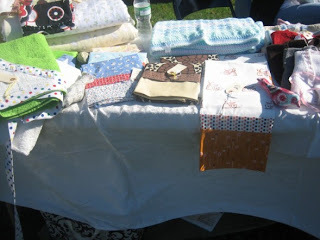 Please consider joining us ... it's a really fun swap! All of the rules and details can be found at the link, and I'd be happy to answer any questions that you might have. Signups end tomorrow, so don't sit on the fence! Hope to see you there. I know this is my 100th post and it's kind of anticlimactic, but there is a giveaway in the works. I'm just not ready yet. Maybe a 105th post giveaway?? 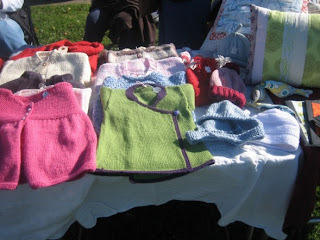 November was SewHelpMe's month in our SewConnected group. She sent a beautiful selection of fabrics (above) that featured a few pieces from the Sand & Surf line along with some fabrics that she selected to coordinate. She was very nervous about the fabric selection, but the blocks that have been made so far have been amazing and I think it will be a gorgeous quilt. Here is the first block I made. I didn't have much of a plan when I started cutting, except that I wanted to feature the medallions and had the idea of seeing them as if through windows. 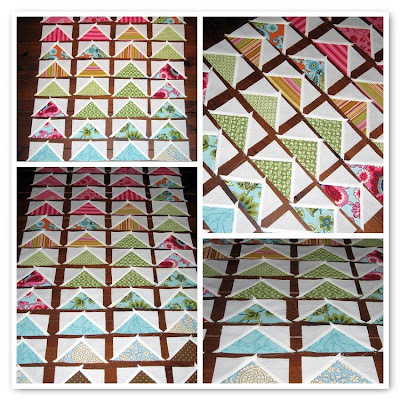 I've really been exploring making quilt blocks of my own design in this swap, as opposed to the Craftster swap where I largely worked from more traditional block patterns. I loved working with these fabrics and I'm really happy with how this block turned out. I was having such a great time and had enough fabric, so I decided to make a bonus block. Again, no pattern ... just the idea of highlighting these smaller medallions in a checkerboard design. I love the punch of the coral-colored fabric, and the graphic print on the left side ties all of the colors together. I'm getting ready to send out a few swap minis this week ... pics to come soon, with any luck! I've long admired people who can accept the fact that some projects are just meant to be long-term projects and enjoy working on them a little at a time, over a long course of time ... projects that are more about the journey than about getting something done. A great example of this is Anina's Dear Baby Jane project, which I love to follow every step of the way (but haven't joined, because of all of those miniscule pieces and freezer paper and paper piecing and applique and other crazy things that I'm just not ready to mess with yet). But when I saw that Sarah and Amanda Jean were both starting to work on a long-term project and had set up a Flickr group to encourage others to do the same, I was all in. 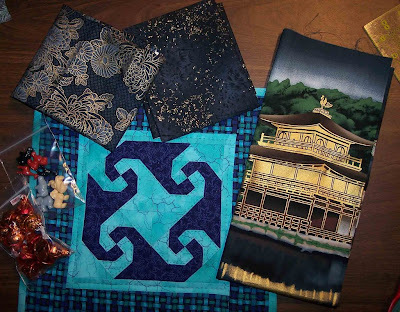 The group is called Tokyo's Triangles because the project is based on an amazing quilt that was featured at the Tokyo International Quilt Festival. The quilt is made up entirely of flying geese, but some of them are tall & skinny while others are short & fat, resulting in a beautiful forest-like effect. 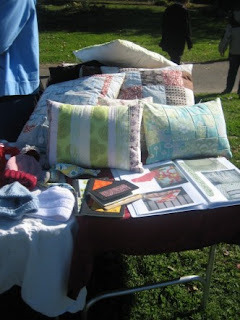 Inspiration quilt can be seen here. The group can be found here. Come join us! Here are my first 48 triangles. I used the tutorial that Amanda Jean recommended and was truly surprised at how quickly I was able to make so many pieces. 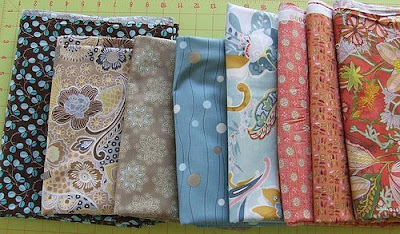 All of the fabrics you see here are scraps from other projects that either my wife or I completed. I've been busy going through all of our old fabrics and cutting them into 5.25" squares for this project. I've decided that I won't buy a single fabric for this (except for the white), and it will be the ultimate stashbuster. 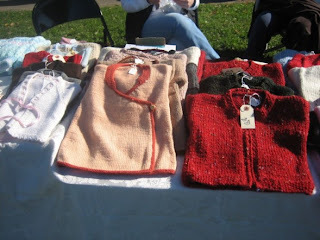 Thanks again for all of your advice and good wishes for my mom's craft sale last weekend. Many of you have been asking how it went, so I thought I'd share some pictures from the beautiful day overlooking the water in Brooklyn. I wish I could have been there! Unfortunately, sales were not as strong as she was hoping. It turns out it was more of a $10 and under crowd, and while people ooh'ed and aah'ed over everything on her table, it didn't seem they were really there to shop. (My brother's girlfriend, on the other hand, had a table of homemade chocolates and candies and SOLD OUT. Again, I think it was that lower price point). But my mom is not discouraged. She's on the lookout for other sales ... maybe ones that are more craft-focused where the clienetele have a better idea of what they're shopping for. More to come, I'm sure! On an unrelated note, have you voted yet? If not, what are you waiting for?? !